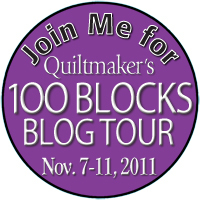 So happy you dropped by to enjoy this fun 100 Blocks Blog Tour, by Quiltmakers Magazine. Vol 4 is here, and you have a chance to win a free magazine issue! I feel lucky to be one of the designers picked to have a block in this issue! As you turn the pages of the magazine you can see many wonderful creative blocks designed specifically for this issue. I was on a little kick with yoyos when I designed this block. 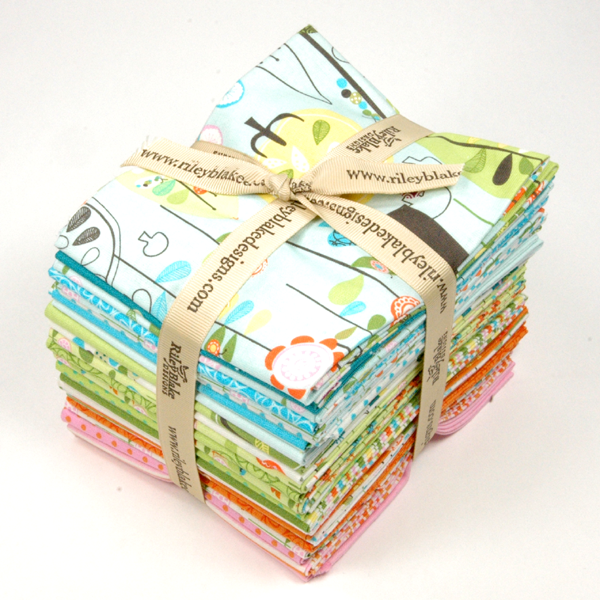 I chose the line Happier designed by Deena Rutter for Riley Blake Designs. When I look at this line of fabric I think happy thoughts. How can you look at these cute bugs and flowers and not think garden cheer? I was inspired by the design of the prints to think flower garden thoughts. Thus, the flower pot with all the cute yo-yo flowers. Below I show how I made my yo-yo flowers. There is also the option of the clover Yo-Yo Maker tool. I like making my yo-yos by first cutting a circle. This one is approximately a 4" circumference and will make a yo-yo about 2" in circumference. Use double thread in your needle for stitching. Use your finger to press as you stitch a running stitch around the outside edge of the circle. Turn the raw edge toward the center of the circle 1/4". Continue to stitch all the way around the outside edge of the circle. Once you finish your yo-yo, pull your stitches in firmly, without breaking the thread. Take your needle to the back and make a knot to finish. For the flower stems I used the bias tape maker. I love the Bias Tape Maker by Clover. This is a fabulous tool that makes these wonderfully perfect 1/4" bias strips. I think this block would be great in a table runner with 3 or 4 blocks and some sashing to frame the blocks. You could alternate the direction of the blocks making it non-directional. How cute would a scrappy 2 1/2" checker board border be with yo-yos. Place the yo-yos on the white 2 1/2" block and the other blocks would be scrappy 2 1/2" prints left over from your blocks. Soooo Cute! Don't forget to leave your comment and receive your chance to win a free copy of this magazine! It is super easy to enter! Please make sure to leave a comment and be a follower of my blog.Your comment needs to be in by November 12th. Say something that makes me remember who you are!! Tell me what you have enjoyed or learned by following this blog tour. 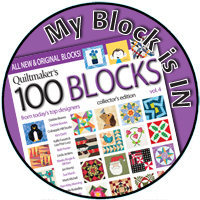 So leave a comment today and be sure to check back next week to see if you have won a copy of the Quiltmakers 100 Blocks Magazine. If this is your first time here please visit again and enjoy the rest of the blog tour. I would love to win that magazine, as it is difficult to get around here and keep seeing it on the different blogs. Congrats on getting in! I love your block, it is so cute!! You are such a rockstar! Love your cute block - such a creative way to use yo-yos. I'm a new follower. Thanks for the chance to win. Congratulations on being in the 100! How wonderful and I love the yo - yos! thanks! I would love to win a copy of the new magazine. I love your block and I am reminded to make use of my tools to help make applique pieces. Sometimes I forget how much easier it is to use them. I love yo-yo's and I love how you have used them in your cute block. This would make a cute quilt/tablecloth for a picnic. I like yo-yo's but avoid making them unless I have the new tool that makes it easier. Your illustration of just turning the edge makes the process look easy! My edges are never quite so even if I make them from scratch. Love your block--congrats on being included in Volume 4! I have never been a fan of the yo-yos. However, your block is very cute. This I would do!! Yo-yo's..a memory of a doll whose lanky arms and legs were made from fabric gathered discs of ev'ry colour shade and hue and made me laugh and Grandpa too as they dangled and jangled with bells, ah yes..the feet and hands of that dear clown, would jingle, jangle as they dangled down. I wonder what became of that dearest doll, your yo-yo flowers brought it to life again in my mind! I would love to make some for myself...might even make a clown as well.. thank-you! This blog tour has opened up lots of possibilities to me, a novice quilter. It has been fun and inspirational. Thanks for the tutorial on the yo-yo's. They really do look really easy to make. To remember me: I am an old worn out typist spending the rest of my years left my making quilts, so I really do need to win a copy of the Quiltmaker's 100 Blocks, Volume 4 so that I can enjoy all of the talented designer blocks and actually make a quilt for myself. Congratulations on being in the magazine.I love yo-yos and love how you use them,very nice!! I'm a new follower thanks to this blog hop. I'm Kristen (Ten for short) and I quilt, so my blog is called Ten Quilts. People think it's because I've made ten quilts, but I've made WAY more than that ... nearly ten this year already. But I've never made one with yo-yos yet! Maybe one day ... if I ever get a Go Baby that cuts the circles out nicely for me! Thanks for the chance to win! Cute block. I've never made yo-yo's, but think I'll give them a try - they look pretty easy! Jumping around from blog to blog has given me a new appreciation for all of the quilting techniques out there. Thanks for the opportunity to win. I have really been enjoying looking at so many blogs that I haven't visited before. Your block is very cute. great choice of fabric. Thanks for the chance to win! Happy fabrics! Just the right block to start a spring quilt to work on through the winter. You will remember me because I spell Purl the way you do when knitting and I like mother-of-pearl buttons. I love your blog. It inspires me to try new things. I always think I am too new to quilting to do stuff that is different but you make it look easy. Thanks. I'm just basting a quilt that I used yo-yos for in the border. It's a trip around the world in the middle, with yellow center blocks, then mixed in with blues and greens with yellow accents in the fabric, reminds me of the sky and grass with dandelions coming up. Then the outer border is white with a green bias vine gently curving along with yo yo flowers made from the block fabrics all along it. I'm going to do a basketweave stitch in the blocks, and echo quilt around the vines and flowers in the border. What a cute block! This is my first time visiting this blog. I'm now a follower via Google Reader. If it wasn't for the blog hop, I would have never found you! By the way, Thanks for the chance to win. This block is adorable. I love working with yo-yos. I also love the fact that the English call them Suffolk Puffs - sounds much more elegant! I am new to your blog. Love your block! I have so enjoyed the previous issues of 100 Blocks. And this one looks just as great! Thanks for the giveaway. Yo Yos are so fun. I really like using the Clover makers now that I have discovered them. Your block is great. Thanks for the instructions and ideas. The block would make a great tablerunner this spring. I will have to get busy. I am enjoying the blog hop because it is introducing me to so many quilt artists that I was not familiar with. This would make a great block to construct while watching TV! No idle hands here! I am now a follower! Love your block. What a beautiful block, really like it and have learned a lot. Cute block! I love the Happier fabrics too. I have been inspired by all the creativity I have seen on this blog tour and I am so anxious to get the magazine. I've discovered some blogs that are new to me and yesterday I learned about Wash Away Applique Sheets which sound amazing! And an applique method that uses them, which I can't wait to try. You can remember me because I have the same name as Elvis' daughter (well, not the last name) -- but I had it first! Such an honor to be chosen for the magazine! Applause and congrats in is order! Great photos from Houston! Thanks for sharing. Hopping through blog land...here I go. Love your block very much! How timely was that! I am about to start a yo-yo lion for my 18-month old granddaughter & have not done them in years! Your tutorial was great! Thanks so much & for the inspiration to try something new in quilting! cute block! I definitely see the runner idea, but also a spring/summer purse! your follower button wasn't working just now, so I'll have to come back to try that again...something to remember me...I'm making my daughter's wedding gown...but I don't think she'll let me have any yoyos for part of the design! I just spent a long time enjoying going through your blog. I didn't mean to - but hey, it was so interesting see all those booths and scary actors. I do really like your yo yo block and I'm glad it was chosen - it deserves it! It looks like a lot of fun to make. I envy you at being able to make those yoyo's from "scratch". I cannot even make one with the forms that are available. Very cute block. Thanks for a chance to win a copy of the magazine. I'm a new follower so you should remember me for that, and I love your block. I like the way yoyo's give a nice dimension to blocks. I believe you have inspired me to try a yo-yo or two. I'm a new follower. Congratulations! Remember that I'm Sallie with an IE. :) Thanks for the giveaway. I'm from the UK and a new follower! I like making yoyos and I love what you've done with yours! It's been so much fun wondering around the blog-isphere looking at all the wonderful blocks! Thanks for the chance to win! I just followed you here. I love finding new Blogs to read as I blog hop. I'm a Tester for the Vol 5. Maybe I'll get to test one of your blocks for that issue. Your block is really fun, and looks like fun to do. Gotta give it a try! Congratulations! So sweet! Your block reminds me of a lollipop graden, if lollipops grew in a garden! Your block is one of the best, so fresh and bright. Sure hope to win a copy of this new magazine. I'm a new follower too!!! I've always liked yo-yo's but never knew what to do with them. Thank you for giving me some new ideas. I haven't done yo yos in so long. This inspires me as do the other blocks I look at. So much imagination! that looks a lot easier than the commercial yo-yo makers. thanks for sharing. I think I need to get on the yo-yo bandwagon and start making some. Love yo yos and how cute in your posies! You are helping to change my feelings about yo-yos. Lately, I've been seeing things made with them and now I like them. Love your block. I'd love to win the 100 Blocks. I havent done yo-yo's in a long time. Looks like I need to start them back up. Thank you for your reminder of how beautiful they really are. There are so many wonderfily talented designers on the blog tour. I have learned so much. Thank you for sharing with us. I enjoy seeing the wide variety of blocks and all the lovely fabrics! Darling block, I love yoyos and made the Presidents block for our Quilt Guild from a pattern of yoyos out of 100 Blocks Vol 3. Might have to do the same this year! Thanks for the chance. And the great pictures of Market! Cute way to use yo yos. Your yo-yo basket block is just as cute as a bug's ear... Congrats on having your block included in the magazine, what an honor! Your yo-yo basket block is just as cute as a bug's ear. You must be thrilled to be included in the magazine! What an honor! Aren't yo-yos fun? That's a charming block you created. What I have enjoyed most with the tour is going to blogs that I have not been to before. I have added many to my favorites (including yours). I liked all of the pictures you posted from Houston. Thanks for a chance to win. The blog tour has been such fun--seeing all the creative ideas makes me want to run to my stash and then race to my sewing machine! Thanks for the plug for the bias tape maker. I was on the fence about buying another "thing", but I believe I'd use it--and look at the cute things I can create with it. Love your block, so cute! I can see a whole quilt of this block by varying the fabric for the flowers. Thanks for the chance. Just signed up to be a follower of your blog after looking at the Houston show. Your yo-yo tutorial is well executed. What a neat block! Thanks for the great giveaway too! Love this block and love the informaation on mation yo yos. Can't wait for the magazine. I love your block! Congrats on being in the 100 Block issue! I look forward to this Blog Tour each year. There's so much talent out there in the world..it's so inspiring to see all the different designers working on so many different things. Love your block and the yo-yos. Flowers in blocks are my favorites. Would love to win the magazine to make your block. Oh my goodness what a cute block - all the inspiration from "you all" is making me wish I didn't have a full time job. I'm sorry, I don't follow your blog. But I had to comment about your lovely block. 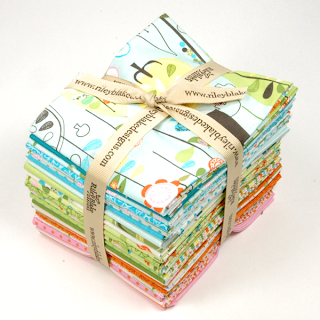 Yo-yos looks great in quilts, but they work so perfectly in this line of fabric and applied to this summery block! What a cheery basket of flowers. There's nothing like a yo-yo to brighten the day!!! Lovely block with the yo-yos, well done! I am a pregnant Mum of 2, French living in the UK, trying to find time to sew when I am not distracting by blog hops! Super cute block! I've actually just started making yo-yo's with Christmas fabrics for a garland. Love yo-yo's and applique both! Thanks for sharing your block! Very nice block. I love yo-yo's too. I love the idea of the checkered border...too cute! thanks for the chance and congrats for making volume 4! Beautiful block. About a month ago, I started making yoyos with no particular purpose in mind. About one hundred yoyos later, you've presented me with the perfect use. Thank you! Congrats on being in the book -and I love your yo yo's! I love using yo-yos. I get tons of inspiration from these blog tours. This should be memorable, my maiden name was Barney. Thanks for a chance to win a copy of this issue. I have a tote bag full of yo-yo's I won as a block of the month 12 years ago! Maybe time to get another ufo out o' the bin and on the"done" pile! Don't hold your breath! I love yo-yos and even have a yo-yo vest my Mama made for me when I was 14!! She made it for me to wear to my very first concert-Three Dog Night!!! Have the yoyo makers but haven't done anything with them. This will get me going and than ks for the chance to win. Cute flowers! I haven't added yo-yos to my quilting yet. However, I helped my friend make more yo-yos to add to her yo-yo necklaces....her little group of girls she does activities for, made cute yo-yo necklaces from yo-yo's for their mothers for Mother's Day They turned out so sweet! Hi Jina, I am new to your blog but I really enjoyed your post on your block for the new issue of QM 100 :o) Thanks for the chance to win. I'll be following you soon....look out!! love your qpplique block with you-yo- flowers. i'm one of your new followers looking forward to following! Thank you for this chance to win the magazine. I am a new quilter, just finishing my first full size for my granddaughter's 7th birthday using a Laurel Burch fabric for the base. You can see it here at the link below. I would love to get better at this and applique. This magazine looks like it has great ideas as does the blog hop! I love your block and I have been wanting to try Yo-yo's I hope to try it soon. I would love to have this new issue. Cute flowers for your blocks. I'm reminded to get my clover tools out and use them for stems and flowers. A Volume 4 to follow directions should help too. This is a great way to incorporate yo-yos! Thanks for the explanations of how and why you created the block. I'm learning a great deal about using different techniques to "compose" a block on this QM 100 blocks blog tour. Love the yo-yo block! Thanks for the chance to win. I am a new follower of your blog! I would love to make your block to make some pillows for the spring time to put on my front porch furniture. How welcoming that would be when neighbors come over to visit. Yes, we still do that in my neighborhood. I have the most beautiful view of Knoxville, TN from my front porch. You can see the Smokey Mountains, Mt. Le Conte, and the Sun Sphere from the 1982 World's Fair. Life is Good! Your easy directions make me wanna try your yo-yos! !...They'd look really good in my real flower garden! !..and never fade away!....thanks! !..I'll Be Back!! Congrats on being included, Jina! Great use of the yo-yos. Thanks for counting me in. I've never made yo yo's, but your instructions look so easy and your block is so pretty, that I want to make some. Thanks. Love yo-yos and I'm already planning on using your block. Thanks for the tutorial, too. Totally fun block! I love yo-yo's too! Oh my Goodness - all the things that I am learning and all the blocks that I want to make! I don't think - NO, I know! - there isn't enough years left to make all the quilts that I have been inspired to make while looking at all the blogs on the tour. hhhmm, wonder if I can convince my husband that I need to stay home and sew instead of going to work?? I just love this block!!!!! What a wonderful way to incorporate yo-yo's!!! Cute block! Cheerful fabrics--love it! I am now officially a follower :) Kudos on such a great block. It's a great one to work on in the middle of winter, when no blooms are to be found outside! I really don't need this. I have plenty to keep me busy! But ohhh I so want it! The blocks are so pretty! I loved seeing all the lovely blocks during this tour! Hey,i am a new follwer of yours,i like your posts here.